For the past 2-years, Indow has supported the young preservationist networking event at PastForward (the annual National Trust for Historic Preservation Conference). Their support has allowed an opportunity for the next generation of preservationists to meet, share ideas, and get an exclusive view at a historic property they may not have otherwise seen. For the 2018 PastFoward conference in San Francisco, Indow created a special takeaway for attendees. Indow created their first Window Zine. Windows are considered a significant feature of historic buildings and Indow is working to make preserving windows easier for future generations of preservationists, so it is a logical and thoughtful zine theme. Zines are a spin on the more traditional magazine; zines have been created for decades by community organizers, artists, and people looking for way to communicate a message. When Indow asked if I could write a short form piece for their zine I was pleased as punch! 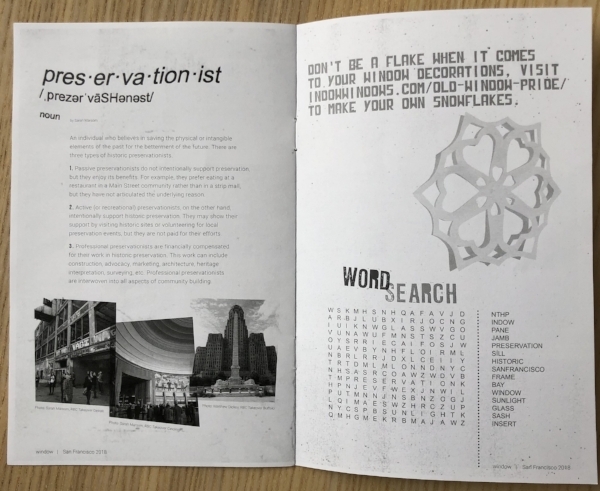 You can read the full piece below the image and if you want to make snowflakes to decorate your historic windows click here. Click here to view a digital version of the zine. An individual who believes in saving the physical or intangible elements of the past for the betterment of the future. There are three types of historic preservationists. 1. Passive preservationists do not intentionally support preservation, but they enjoy its benefits. For example, they prefer eating at a restaurant in a Main Street community rather than in a strip mall, but they have not articulated the underlying reason. 2. Active (or recreational) preservationists, on the other hand, intentionally support historic preservation. They may show their support by visiting historic sites or volunteering for local preservation events, but they are not paid for their efforts. 3. Professional preservationists are financially compensated for their work in historic preservation. This work can include construction, advocacy, marketing, architecture, heritage interpretation, surveying, etc. Professional preservationists are interwoven into all aspects of community building.